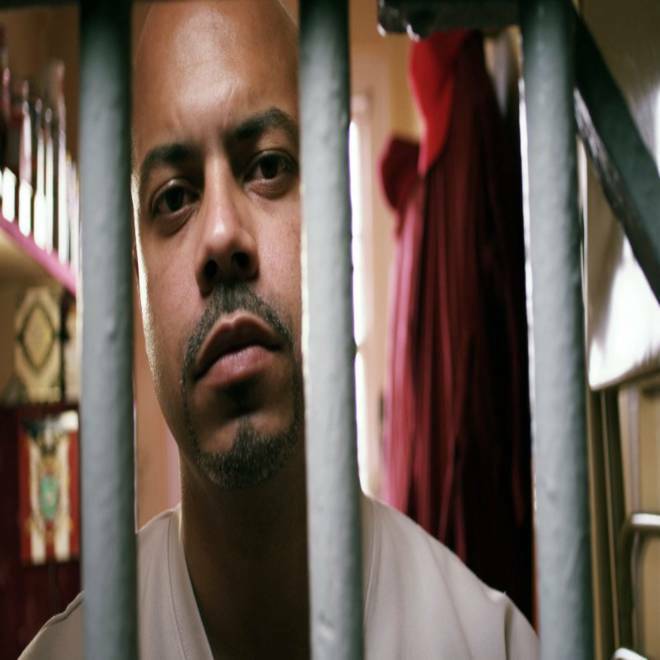 Jon-Adrian "J.J." Velazquez, in his cell at New York's Sing-Sing prison in 2011. The Manhattan district attorney will not reverse the conviction of a New York City man found guilty of killing a retired police officer during a botched 1998 robbery in Harlem, saying its re-investigation of the high-profile case found no evidence to warrant tossing the verdict. Defense attorneys called the decision “unjust” and a “tragedy” and vowed to continue their fight to free the man. Jon-Adrian “J.J.” Velazquez was convicted of second-degree murder and sentenced to 25 years to life for the shooting death of Albert Ward at the illegal numbers parlor the former NYPD officer operated. Velazquez, who said he was at home speaking on the phone with his mother at the time of the robbery, has always maintained his innocence. His case and new information suggesting he may have been wrongfully convicted were the focus of a “Dateline NBC” investigation last year and his innocence has been championed by actor Martin Sheen. The decision comes after an 18-month re-investigation, and is the highest-profile case yet handled by the Manhattan DA’s conviction integrity unit, which was created in 2010. Jon-Adrian Velazquez, currently serving 25 years to life at Sing Sing prison for the murder of a retired cop, started writing letters to a Dateline producer in 2002. He claimed he was wrongfully convicted and challenged Dateline to find any evidence of his guilt. A 10-year investigation begins. Luke Russert reports. Erin Duggan, chief spokeswoman for the DA, defended the review. The DA’s Conviction Integrity Program “voluntarily undertook an extensive reinvestigation of the Velazquez case that included interviewing many witnesses and conducting an in-depth review of documentary and physical evidence from a range of sources,” she said in a statement. The crime at the center of the case occurred on Jan. 27, 1998. About half a dozen people, nearly all drug users or dealers, according to trial testimony, were inside the gambling parlor when two men came in and announced a robbery. Witnesses told police that one of the men had a gun; the other started binding people with duct tape. A struggle ensued and Ward, the former cop, was shot once in the head. The Manhattan DA’s office has been looking into the case since October 2011 at the request of Velazquez’s attorneys, who this week received a 16-page letter from the DA informing them of its conclusion. The letter was reviewed by NBC News. But Gottlieb, who was present during the questioning of the witness, said the DA’s investigators aggressively interrogated the witnesses and ultimately discounted their accounts. “Our witnesses who had the courage to come forward were treated like criminals when they agreed and did speak to the district attorney,” Gottlieb said. Gottlieb also says investigators did not re-interview Velzaquez’s mother, Maria, or Vanessa Cepero, his then-girlfriend, both of whom swore under oath that Velazquez was at home on the phone at the time of the robbery. Why initial descriptions of the gunman bear no resemblance to Velazquez? What, if any, relationship exists between Velazquez and Derry Daniels, a career criminal who pleaded guilty to acting as Velazquez’s accomplice in the attempted robbery? Velazquez told NBC News he has never known or met Daniels, and the DA’s letter acknowledges there is no evidence linking the men. Daniels, who spent 10 years in prison and is now free, did not cooperate with either DA or defense investigators. Why don’t investigators believe the key witness, Augustus Brown, who was the first to identify Velazquez as the gunman but later recanted? Brown now says he picked Velazquez’s photo randomly from the hundreds of photos police showed him. What evidence exists to rule out other possible suspects identified by defense attorneys? The DA said in its letter that it investigated the leads about “Mustafa,” but did not detail what led to the conclusion they were not valid. Gottlieb said his office will now file a court motion to vacate Velazquez’s conviction, meaning a judge will ultimately make the final decision whether or not the conviction would stand. Questions about Velazquez’s involvement in the shooting arose even before his conviction. 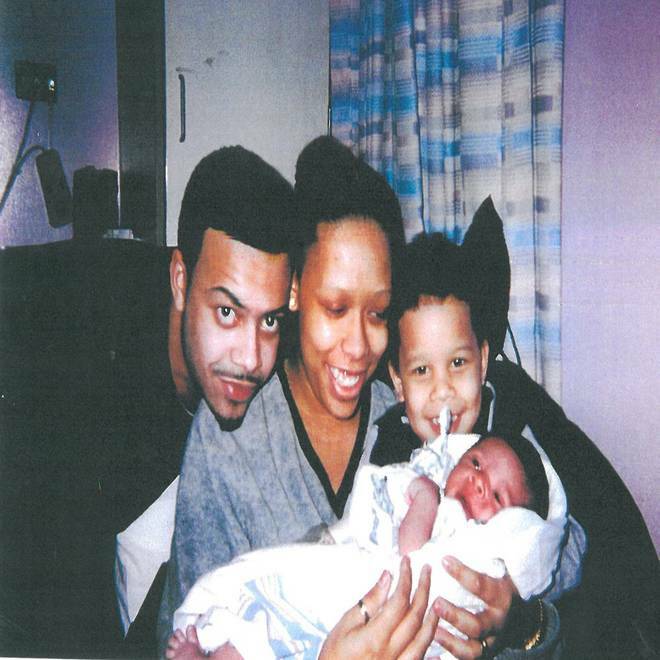 Jon-Adrian Velazquez with Vanessa Cepero, his then-girlfriend, and two sons shortly before he was arrested in 1998. According to police records, within hours of the murder, all witnesses gave police similar descriptions of the gunman as “a light-skinned black male,” with “dreadlocks” or “cornrows.” The shooter’s accomplice was described in police reports as a “dark-skinned black male.” At the precinct, witnesses were shown books with hundreds of mug shots. Records show that none recognized the gunman, but one identified Daniels as the accomplice. Daniels was arrested and eventually pleaded guilty to first degree robbery. 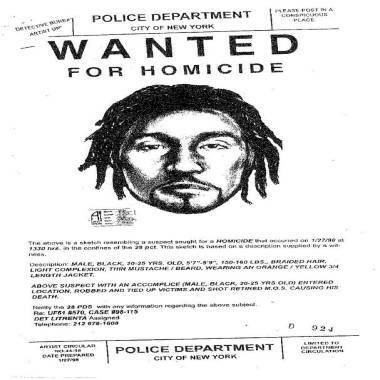 The "wanted" poster distributed by police immediate after the Jan. 27, 1998, slaying of former NYPD Officer Albert Ward. While carrying out a city-wide search for “Mustafa,” police also sought two witnesses who fled the scene: Augustus Brown, the heroin dealer, and a heroin addict named Lorenzo Woodford, according to the reports. They found Woodford first, who also described the shooter as a “black male” with “cornrows.” Then, Woodford told the cops where they could find his drug dealer, Brown. Police immediately began searching for the man whose photo was picked out by Brown: then-22-year-old Jon-Adrian Velazquez, a Hispanic man who had never wore his hair in dreadlocks, records show. And the active search for the previous suspect, “Mustafa,” ended. Months earlier, Velazquez had been arrested for drug possession, according to police records – and while he was never convicted of that or any other crime, police had his mug shot in their files. When Velazquez heard police were looking for him, he turned himself in, saying he had no knowledge of the crime, and volunteered to appear in a line-up, the records show. There was no physical or forensic evidence linking Velazquez to the crime." In addition to Brown, two other witnesses – brothers with criminal and drug histories -- picked Velazquez out, and he was arrested for murder. At his trial, Velazquez, his mother and then-girlfriend all testified he was at home in the Bronx, on the phone with his mother during the robbery, and produced phone records in an attempt to prove it. But the jury, which didn't hear about "Mustafa," didn’t buy it, and Velazquez was sent away for 25 years to life. Last year, NBC’s “Dateline” reported that at least two of the witnesses who identified Velazquez had recanted. Brown, the witness who first identified Velazquez, told NBC News that when he was brought in by police to look at photos, he had 10 bags of heroin in his possession. He also said that police pressured him to make an identification. Only after he picked someone at random – who turned out to be Velazquez -- was he allowed to leave the precinct station, he said, adding that he was allowed to take the drugs with him. In its letter to Velazquez’s lawyers, the DA’s office said it had re-interviewed Brown, who “unequivocally” stood by his recantation. But that alone was insufficient to reverse Velazquez’s conviction. The second witness, however, "has withdrawn his recantation, and we will likely never fully understand the reasons for his varied statements,” the letter said. Dan Slepian is an investigative producer with "Dateline." Click here to send him an email; Miranda Leitsinger, an NBC News staff writer, contributed to this report.